Contractors have been in the practice of installing helical piers when making foundation repairs or during utility wire applications for many years. It is just recently that they have begun to install them under the construction of new homes, to add further foundation stabilization. These piers come highly recommend by engineers all across North America. They are a deep foundation element that is being used to replace applications such as spread footings and shallow poured concrete piers. Your home is likely built on active soils. 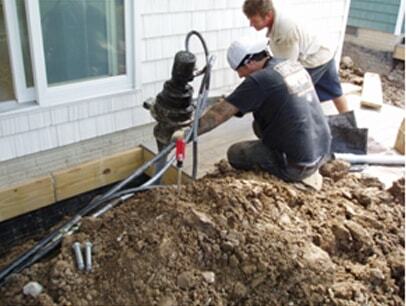 We use helical piers to anchor your home to stable soils which are found much deeper. With the use of the piers, there are no complications of them being improperly installed. Due to the fact that there is no wait time for concrete to cure, the helical piers can be installed during any weather condition. When you call, we will work side by side with you and find the right solution for you. Helical piers are the number one sought after device for foundation repairs due to the fact that they can be used almost anywhere that traditional deep foundations can be used. They also tend to be more economical for limited access sites and work great for vibration-free and noise-free applications. 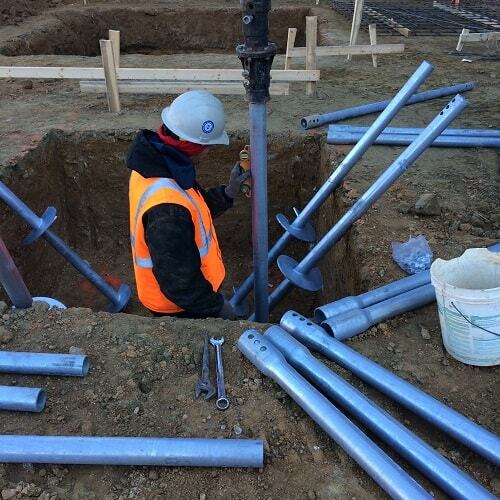 Helical piers are installed using a torque driver machine that is generally attached to a mini excavator used to drill them into the ground. The helical piers screw themselves through the many layers of poor, soils which are not supportive that lie on the surface until they finally land and secure themselves into bedrock. Due to the nature of the installation process, the helical piers in your North Carolina home can be installed year-round and only require small equipment, so there will be little disturbance to your home and its surroundings. They are mechanically installed by screwing them deep into the soil and we closely monitor the installation to assure optimum capacity. Once we have them at capacity, we will install and attach an underpinning steel foundation bracket to the piers and carefully transfer the weight of your home onto the piers. This will ensure no future sagging and shifting of your home. Contact us for more information!